One of the largest penny auction sites, QuiBids.com. 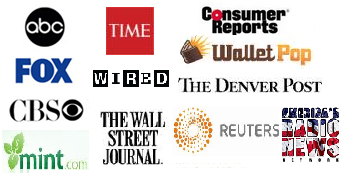 has just introduced a new bidding feature on all of their auctions. Users that start bidding after a penny auction has progressed in time, and increased in bids, have been termed “jumpers” by the penny auction community. QuiBids’ new feature limits the bidding competition. QuiBids is limiting bidding competition by locking auctions. 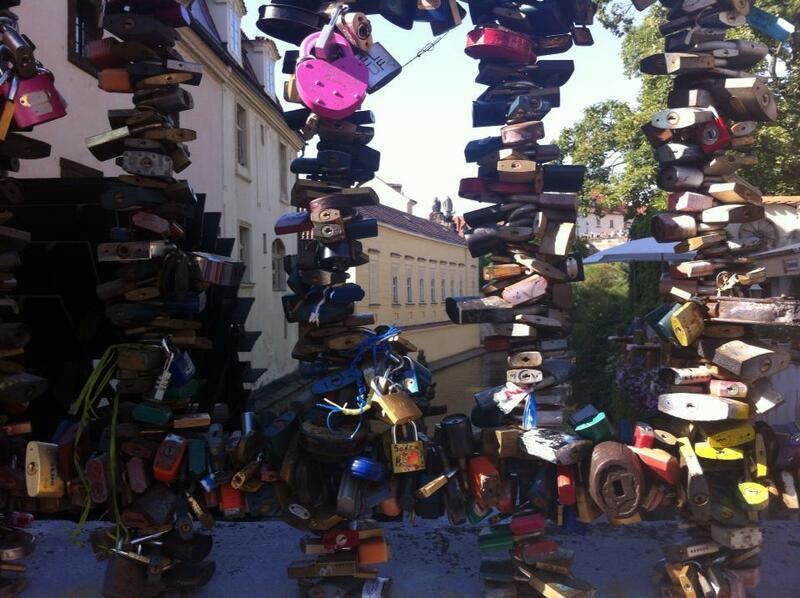 Locking auctions limits the competition to bidders who place bids before the lock threshold point. All QuiBids auctions will now disallow late entry to any penny auction after a certain point by “locking” the bidding out to new bidders. How is this point determined and how can you find out how often you have to bid before being locked out? QuiBids recently published a really helpful infographic that will give you insight into knowing how to keep from being locked out of an auction without using a lot of bids. There’s an equation behind it. The equation, Ok, not to throw math at you, but in this case it’s absolutely necessary – the equation is VP/4=X. This just means you start by dividing the auction’s value price by 4. This will give you the time in minutes that you have to place a bid before the auction locks. Say the item’s value is $50. 50/4=12.5 – so, 1 bid has to be placed by you every 12.50 minutes or else you will get locked out. Thanks @QuiBids for this infographic explaining how to save bids without being locked out! Last year, penny auction site DealDash did something very similar with their “No jumper” auctions. Jumpers are bidders who come into the game late with hopes of winning the auction, and therefore could cause you to lose more bids than you might have had they not entered late. For those of you worried about “jumpers,” you may want to check out penny auction sites like QuiBids or DealDash that offer “no jumper” and “locked” penny auctions. if you want to participate in any auction on their site you will have to be sure to place a bid towards the beginning of the auction and not “wait in the weeds” and “jump” in later. 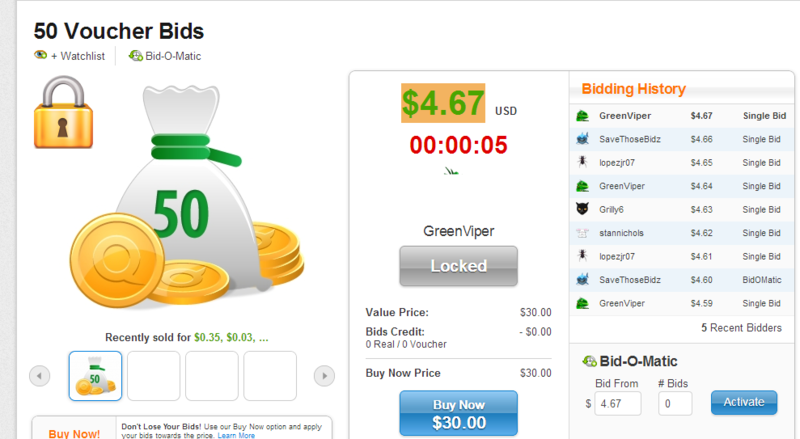 Back to QuiBids’ 50 voucher bids auction, the item just ended at $5.88, 588 bids were placed by all participants. 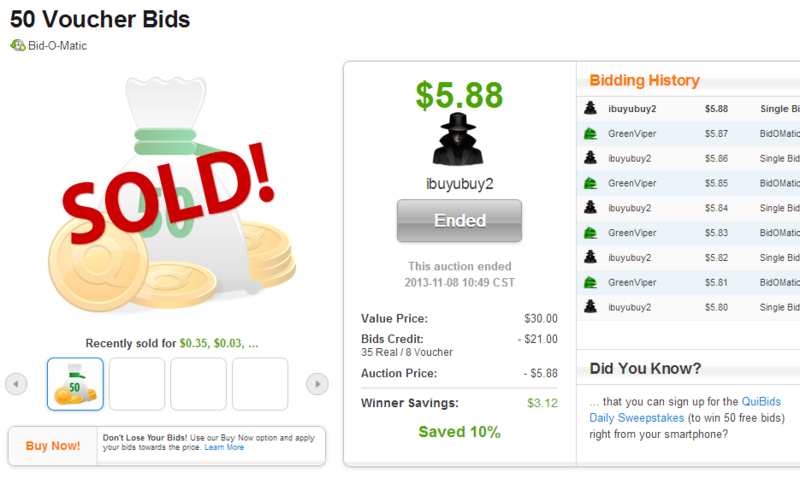 The winner, ibuyubuy2 placed 35 real (paid for) bids and 8 voucher bids for a total of $21 spent. While we don’t know what other bidders, or how many participated in the auction – it may not have been as easy for ibuyubuy2 to win 50 voucher bids (valued at $30) for 21 + 8 voucher bids. Not the best deal, at least ibuy2buy2 gained a few more bids than he would have had he had to bid longer. What do you think about QuiBids locking auctions? What have your experiences been with QuiBids? Join us in discussing “Locked Auctions” and all penny auction topics! Join our forum now, it’s free!